Grandma has been preparing for winter. She has knitted scarves that are just the right size for the children of the town. The scarves are 5 hand spans long. 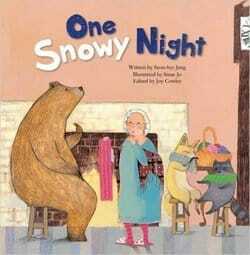 But on a snowy night Grandma has some surprise visitors that are cold. She needs to measure her visitors for blankets. How does she measure them? What size blankets do they need? Seon-hye Jang’s ‘One Snowy Night’ is part of the world’s largest mathematical story picture book series, called TanTan Math Story (70+ titles). The English translation of this original South Korean version was done in 2016. The story is about a Grandma who, on one wintery night, is visited by a big bear, a fox and a racoon – all of whom are seeking shelter from a snowstorm. To keep them warm, Grandma offers them scarves and warm blankets. To ensure she gets each of them the right-sized scarf and blanket, she measures the width of their neck and their height with her hand spans and arm lengths. The story provides a perfect context for children to learn about non-standard measurement units and can be used to prompt them to think about other non-standard measurement units that can be used to measure everyday items. Like most titles in this series, the book comes with a few mathematical word problems relating to the story to be solved at the end of the story. All in all, ‘One Snowy Night’ is a great story to introduce the concept of measurement, particularly non-standard measurement units to children aged 5+ years old.